Large capacity 12 cu. ft. black composter sits on a wheeled base for effortless turning and mixing of the compost. Recessed handles for easy turning and a large 16 twist lid for easy but secure access makes this pet, child, and pest proof. Black color holds heat and accelerates composting action. Fully assembled, made in the USA of 98% post industrial recycled polyethylene. 7 cu. ft. black composter sits on a wheeled base for effortless turning and mixing of the compost. Recessed handles for easy turning and a large twist lid for easy but secure access makes this pet, child, and pest proof. Black color holds heat and accelerates composting action. Base holds compost tea. Fully assembled, made in the USA of 98% post industrial recycled polyethylene. 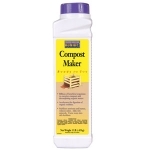 Humus Builder; This organic product contains beneficial organisms that energize soils, composts, decomposing organic matter. It stabilizes nutrients and humus, and reduces odors. May be broadcast dry or sprayed with water onto garbage, leaves, vegetables. Composts lawn clippings, brown leaves, and hard to compost items such as wood chips, pine cones, and twigs. Converts 500 - 750 lbs. of yard debris to mulch.